What if you found yourself in a situation where you didn’t have a lot of free time to experiment in the kitchen, but still did enjoy cooking and eating delicious homemade food, what measures would you put in place? Sure, you could opt to buy ready food, but it is mostly unhealthy and barely tastes as good as food prepared at home. Besides, there is no sense of satisfaction or achievement with buying a heat-up dinner. The other option is to employ the use a pressure cooker which greatly reduces cooking time and still retains vital nutrients and great flavor and color. This means that you can enjoy a great meal that will only take a few minutes to cook. But with so many models in the market, finding the perfect deal can be a daunting task. The Cuisinart CPC-600 has a bunch of useful safety features, simple control panel as well as pre-programmed functions that both newbies and aficionados can use and love. It comes inclusive of a cookbook featuring close to 50 recipes for side dishes, soups, appetizers, desserts and entrees to mention just but a few. It is definitely a hassle-free appliance that will almost do everything for you and leave you to tend to other household tasks while the food cooks. All you need to do is program the machine, and you won’t be obliged to remain in the kitchen and play monitor until the food gets cooked. Once the food is ready, the unit automatically switches to keeping warm for a period of up to 12 hours. 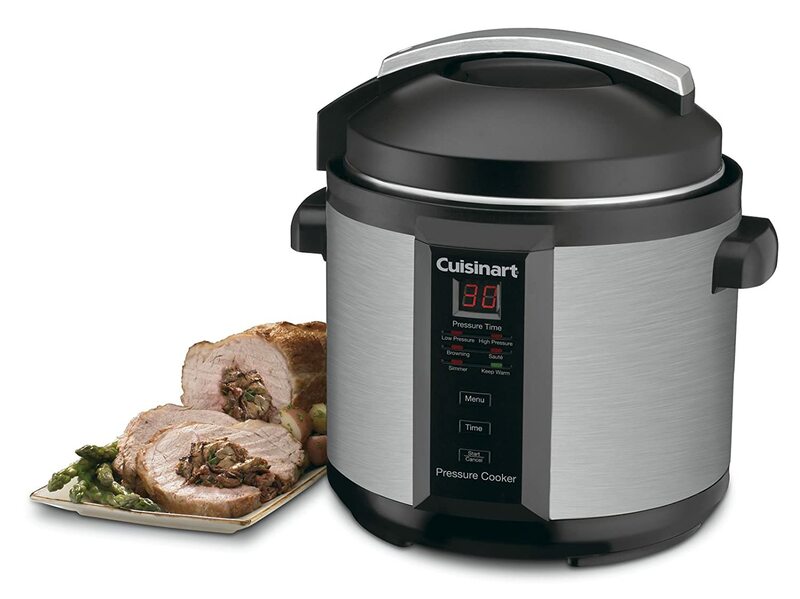 The Cuisinart CPC-600 1000-Watt 6-Quart Electric Pressure Cooker automatically builds up the pressure adjusts the temperature to maintain the preset pressure and then changes to the keep warm setting when the food has cooked up to the number of minutes that you specified. It’s simple to utilize, very secure and cooks up to 70% faster than ordinary techniques. The food is also superbly healthy. This unit traps steam inside that escalates pressure levels to make hotter temperatures. The firm lid blocks in moisture, flavor, and heat, as well as vitamins and minerals for exceptionally healthy and tasty dishes such as chili, soup, chili among others. It cooks with very little water and thus enables you to discover out-of-this-world tastes and textures which are simply fabulous. Moreover, the 6 quart electric pressure cooker performs wonderfully for custard and cheesecake – for the simple reason that you cannot afford to leave dessert off the menu. Housed in polished stainless-steel, this Cuisinart 1000-watt pressure cooker measures 12-1/5 by 12-1/5 by 13-1/5 inches. It weighs a cool 14.2 pounds when empty. Although in the 1000-watt power range, the Cuisinart electric cooker still conserves energy due to the short cooking spans. It features a six quart capacity and a stainless steel and matte black finish. It has the ability to sauté, brown, simmer and warm food. When the lid is off, you have the option to sauté vegetables; simmer liquids or browning your meat without the additional trouble of using a separate pan and heating it elsewhere. This Cuisinart electric pressure cookware features digitally-controlled push buttons, easily legible display and preprogrammed configurations for high and low pressure instantly get rid of any lingering uncertainties. The unit automatically locks the lid shut when pressure is high. This way, even if your appliance gets knocked over by accident, the lid won’t budge. The anti-block cover holds the gasket in place and also acts as a “false” bottom for the pressure cooker lid which helps prevent food from blocking the pressure valve. This way, the handle stays cool thus avoiding accidental burns. The pressure relief device works by moving the pot downward which breaks the seal between the gasket and the pot, if and only if the maximum acceptable pressure is exceeded. The thermostat shuts off the unit if it’s operating with no food inside – this could damage the machine. The digital thermostat also works accurately in adjusting temperature ranges. The thermal fuse opens the power circuit if the machine surpasses maximum temperature. The Cuisinart CPC-600 1000-Watt 6-Quart identifies a floating (non-venting) pressure valve/ spring valve which performs excellently by releasing less steam and much more quietly than the weighted valve type. The closest you get to spitting and hissing is when you use the “quick release button” – which actually is pretty much tame. Moreover, due to the fact that the unit doesn’t release large volumes of steam, it does not also raise your kitchen’s temperature like some do. One of the major clues to the potential durability of a product is how long a guaranty the manufacturer is willing to offer. This Cuisinart comes with a 3 year restricted warranty and at just around $100; you surely couldn’t get a better bargain for all the great functions it has to offer. What Other People Think About the Product? There are many reviews of this pressure cooker and most were very satisfied with its performance. It is easy to use and contains a set-it-and forget-it method for cooking. Users love the safety of the locking mechanism that prevents any hazards and with the pre-programmed features cooking couldn’t be easier. The non-stick surface makes clean-up a breeze. The foods are delicious and the meats are melt-in-your-mouth tender. What used to take hours now only takes minutes. Several users of the Cuisinart CPC-600 1000-Watt 6-Quart Electric Pressure Cooker stated that they wish they had started using a pressure cooker years earlier and that using this cooker has made their life much easier. The recipe booklet that is included is said to be very minimal so suggestions were made to use other recipes and to experiment yourself. One review of a user who was new to pressure cookers revised his negative review with a positive one and a simple suggestion; when you place the pressure release valve on the lid, be sure that the little projecting arm on the valve is precisely parallel to the lid’s handle. If you do that, the cooker will get up to pressure, and the digital display clock will count down, just as it’s supposed to do. For a large pressure cooker that is economically priced and that is easy to use we would feel very comfortable in recommending the Cuisinart CPC-600 1000-Watt 6-Quart Electric Pressure Cooker. Truly speaking, with this Cuisinart latest creation, – the Cuisinart CPC-600 1000-Watt 6-Quart, you are definitely going to have a much better, faster, and healthier cooking experience. This latest Cuisinart is truly a classic that has long been acknowledged by many end users for being totally consistent and dependable. In this modern age, you certainly need to work smarter and not harder each and every time you prepare meals in your kitchen. Many consumers have praised this electric pressure cooker for stocks, healthy soups and tasty fall-off-the-bone meat that are usually ready in record time. Fixing both healthy and delicious meals has never been this easy, all thanks to Cuisinart. Can you use this CPC-600 Series pressure cooker to can green beans? It is generally not recommended to use a pressure cooker for canning. For canning I suggest you take a look at one of these units.